Chris Cook’s bust of Lincoln « Hercules and the umpire. Some of you may remember the Bad Matt from my stay in Sioux City, Iowa. Although generally a horrible person, he is a brilliant law clerk for a very distinguished Iowa senior district judge. I posted about his fatal attraction to Pabst Blue Ribbon, and provided a photo of the stash the Good Matt and I discovered in the Bad Matt’s office. Yesterday, via UPS, I received from Bad Matt a spongy Pabst Blue Ribbon hat. Bad Matt’s note indicated that when I went bald from the chemo, I should wear the hat to protect my noggin. I was shocked. The Bad Matt had played cruel jokes on me when I was a stranger in that strange land we know as Sioux City, Iowa. It never occurred to me that a truly demented Pabst devotee could have a soft spot. 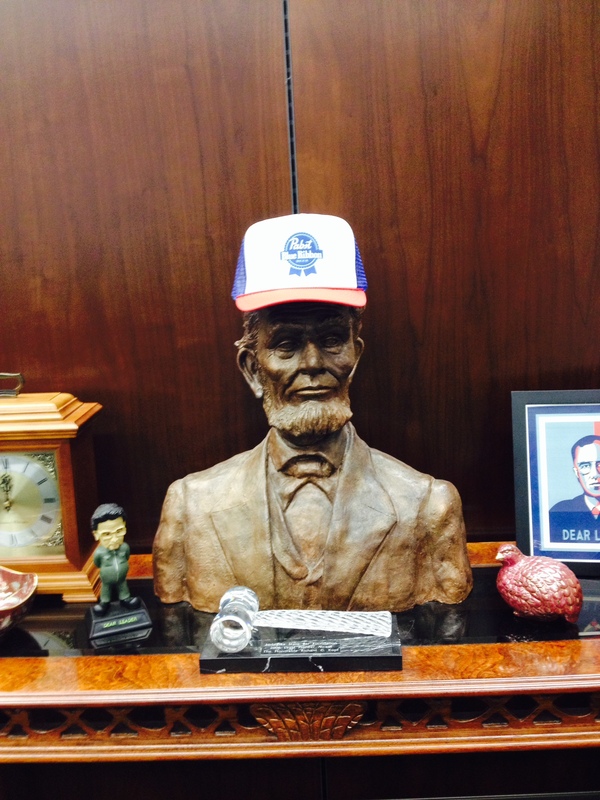 In my chambers near my conference table sits my bust of Lincoln (given to me by Chris Cook, a really good lawyer and even better artist) now wearing my new Pabst Blue Ribbon hat given to me by the bad Matt. Don’t be distracted by the “dear leader” bobblehead. The law clerks pray to that one.